Monday was the 20th anniversary of Amazon, the online retailing giant, going public. On May 15, 1997, Amazon issued its IPO, or initial public offering, meaning you could buy shares of the company at $16. With just 3 million shares offered at the IPO, you could have bought every single share being offered for $48 million. And had you done that, today you’d own 12.6% of Amazon, which would be worth a total of $57.7 billion. You see, all of us, including myself, should be kicking ourselves for not having gotten into Amazon somewhere over these past 20 years. After all, Amazon and its amazing CEO, Jeff Bezos, weren’t a secret. 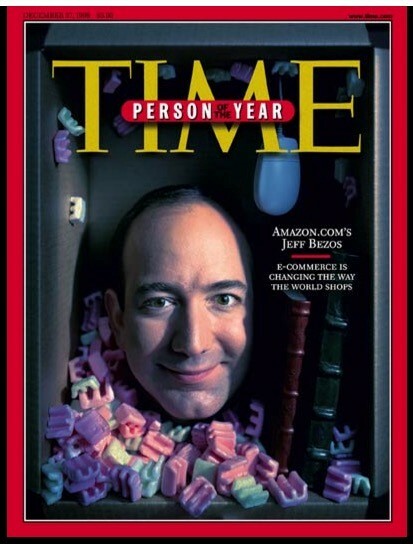 In fact, Bezos was named Person of the Year by Time in its December 27, 1999 issue. This cover more or less marked the top of Amazon’s share price. So, I went back to see what would have happened if you had bought Amazon at the very top of the stock market bubble in 1999. Since that point, Amazon has crushed the market, giving investors a 1,013% return versus the S&P 500, which returned just 70% in the same time frame. In other words, even if you had bought Amazon at the very top of the stock market bubble, you’d have made 10 times your money back. And the thing is … Amazon is still growing as a company, so even greater gains are to come. I’ve gone and studied situations just like this with other stocks such as Netflix and Google, and I have come up with a strategy to get into these types of companies right as their businesses are showing signs of rapid acceleration, or what I like to call true momentum. And now, I’m putting my work into action to pick stocks just like Amazon, Netflix and Google right as they’re getting ready to soar higher and generate massive gains in the future. For details on how to join me in this venture, click here. P.S. Many investors ridiculed the idea of Netflix’s switch to online streaming instead of sending DVDs in the mail. My True Momentum strategy told me better, and I made 634% on Netflix in just three months. I have dozens of examples where this strategy helped me find massive opportunities that Wall Street, the media and the technical traders didn’t see. Click here to get on the VIP list and find out what makes True Momentum such a powerful strategy.